American rabbi; born at Budapest March 17, 1862; son of Aaron Wise. He studied at the College of the City of New York (1887-91), Columbia College (B.A. 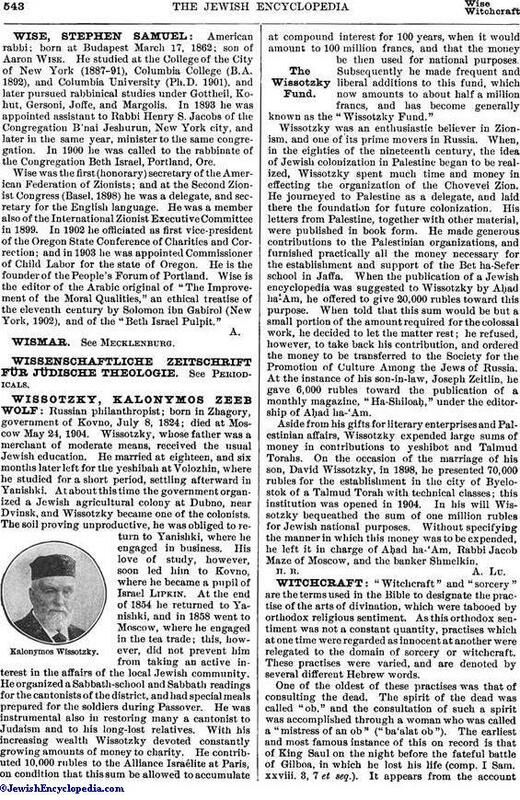 1892), and Columbia University (Ph.D. 1901), and later pursued rabbinical studies under Gottheil, Kohut, Gersoni, Joffe, and Margolis. In 1893 he was appointed assistant to Rabbi Henry S. Jacobs of the Congregation B'nai Jeshurun, New York city, and later in the same year, minister to the same congregation. In 1900 he was called to the rabbinate of the Congregation Beth Israel, Portland, Ore. Wise was the first (honorary) secretary of the American Federation of Zionists; and at the Second Zionist Congress (Basel, 1898) he was a delegate, and secretary for the English language. He was a member also of the International Zionist Executive Committee in 1899. In 1902 he officiated as first vice-president of the Oregon State Conference of Charities and Correction; and in 1903 he was appointed Commissioner of Child Labor for the state of Oregon. He is the founder of the People's Forum of Portland. Wise is the editor of the Arabic original of "The Improvement of the Moral Qualities," an ethical treatise of the eleventh century by Solomon ibn Gabirol (New York, 1902), and of the "Beth Israel Pulpit."